Today’s vehicle is a 1998 Buick LeSabre. The customer had taken it to another shop for a Service Engine Soon light and a hesitation on acceleration. The SES lamp was not on when she took into the shop. They couldn’t pull any codes and told her they couldn’t diagnose her car without codes, after having it for 2 days. They charged her 120.00 dollars and told her if the light comes back on, they would look at it again. Needless to say, she was very unhappy and wasn’t willing to play games with them, that’s when she called me. I assured her I would be able to diagnose her car with no codes, as long as I could verify her complaint. She gave me the chance to look at it. I took it out for a road test and noticed it was misfiring under load and backfiring through the intake. 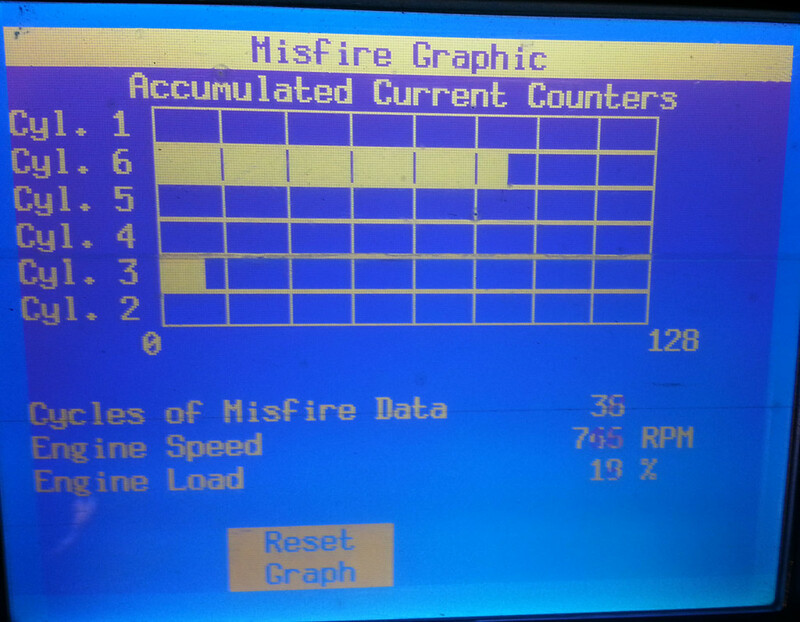 These are the misfires that were captured during the road test with the GM Factory Tech 2 scan tool, under heavy load. It was necessary to hook up my GM Factory Tech 2 scan tool and re-road test it. I found a steady misfire from cylinder #6 and some random misfires from cylinder #3. I came back to the shop and started a diagnostic strategy based on my findings. This lead me to inspect the ignition system and it’s related components. I was shocked that the other shop was unable to help this customer with her car. They should have at least tried. This car has a DIS ignition system. It’s a waste spark design. Cylinders 1-4 share a common coil, as do 6-3 and 5-2. It has 3 coil packs and 1 control module. The spark plug wires looked fairly new and the # 6-3 coil had recently been replaced. The customer said that she had work done last summer in 2012. When I did my diagnostic inspection, I found the coil towers for cylinders # 1-4 and 6-3 were heavily corroded. The spark plug wires were also corroded and the wrong spark plugs were installed. 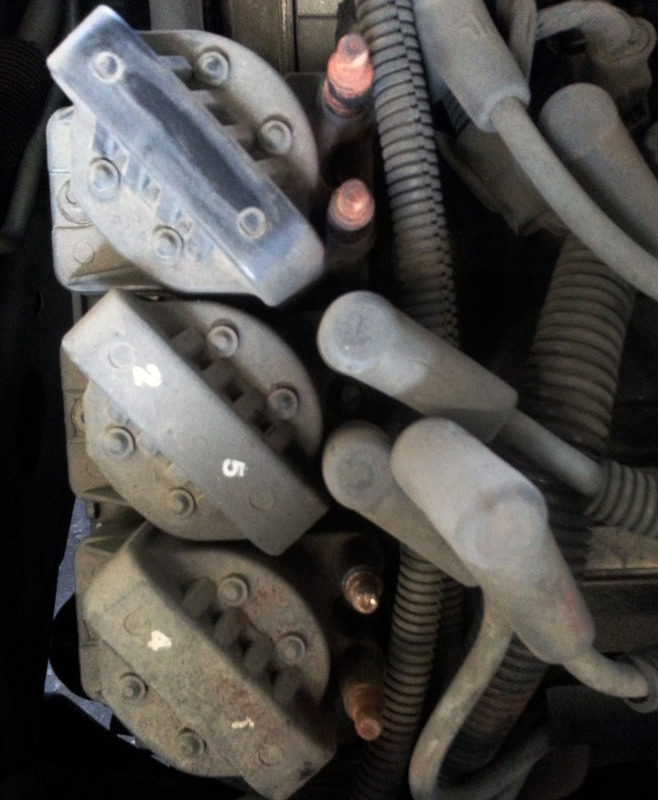 The corrosion problem has damaged the plug wires and both the # 1-4 and new 6-3 coils. Whoever did the work last year failed to use dielectric grease on the plug boots. Moisture accumulated unchecked under the plug boots and corroded the towers and plug wires until it caused high resistance between the coil towers and plugs wires. They could no longer conduct the high KV required to operate the spark plugs during heavy demands on acceleration. The corrosion on the coil towers. This was a simple no code diagnostic problem and was created by poor workmanship. If the previous work would have been done right the first time, this would not be a costly and troublesome issue now. The lack of workmanship caused more damage than it fixed. Fix it right the first time and save money. Letting an unskilled person work on your car will cost you double and your vehicles reliability will be lost. Don’t be a victim of unskilled labor.